This article is about South Asian musical instrument. For the Persian classical instrument, see Setar. For other uses, see Sitar (disambiguation). The sitar (English: /ˈsɪtɑːr/ or /sɪˈtɑːr/; सितार, Punjabi: ਸਿਤਾਰ, sitāra pronounced [sɪˈtaːr]) is a plucked stringed instrument, originating from the Indian subcontinent, used in Hindustani classical music. The instrument flourished under the Mughals, and it is named after a Persian instrument called the setar (meaning three strings). The sitar flourished in the 16th and 17th centuries and arrived at its present form in 18th-century India. It derives its distinctive timbre and resonance from sympathetic strings, bridge design, a long hollow neck and a gourd-shaped resonance chamber. In appearance, the sitar is similar to the tanpura, except that it has frets. Sitar originates from the Persian seh + tar, literally meaning "three strings." There are multiple theories surrounding the origin of the sitar. According to various sources the sitar was invented by Amir Khusrow, a famous Sufi inventor, poet, and pioneer of Khyal, Tarana and Qawwali, in the Delhi Sultanate. Others say that the instrument was brought from Iran and modified for the tastes of the rulers of the Delhi Sultanate and Mughal Empire. Another theory is that the instrument is thought to have been derived from the veena, another prominent instrument in Carnatic and Hindustani music, altered in order to conform with Mughal tastes. The sitar flourished in the 16th and 17th centuries and arrived at its present form in 18th-century India, gaining prominence in the royal court of the Mughal Empire based in Northern India. A sitar can have 18, 19, 20, or 21 strings. Six or seven of these are played strings which run over curved, raised frets, and the remainder are sympathetic strings (tarb, also known as taarif or tarafdaar) which run underneath the frets and resonate in sympathy with the played strings. The frets, which are known as pardā or thaat, are movable, allowing fine tuning. The played strings run to tuning pegs on or near the head of the instrument, while the sympathetic strings, which are a variety of different lengths, pass through small holes in the fretboard to engage with the smaller tuning pegs that run down the instrument's neck. The Gandhaar-pancham sitar (used by Vilayat Khan and his disciples) has six playable strings, whereas the Kharaj-pancham sitar, invented by legendary Sitar Ratna Ustad Rahimat Khan, founder of Dharwad Gharana of Sitar , later was used in the Maihar gharana, to which Ravi Shankar belonged, and other gharanas such as Bishnupur, has seven. Three of these (or four on a Ghandar-pancham sitar or "Vilayat Khan"-style, or Etawa gharana), called the chikaari, simply provide a drone; the rest are used to play the melody, though the first string (baajtaar) is most used. The instrument has two bridges: the large bridge (badaa goraa) for the playing and drone strings and the small bridge (chota goraa) for the sympathetic strings. Its timbre results from the way the strings interact with the wide, sloping bridge. As a string reverberates its length changes slightly as its edge touches the bridge, promoting the creation of overtones and giving the sound its distinctive tone. The maintenance of this specific tone by shaping the bridge is called jawari. Many musicians rely on instrument makers to adjust this. The bridges are fixed to the main resonating chamber, or kaddu, at the base of the instrument. Some sitars have a secondary resonator, the tumbaa, near the top of the hollow neck. Materials used in construction include teak wood or tun wood (Cedrela toona), which is a variation of mahogany, for the neck and faceplate (tabli), and calabash gourds for the resonating chambers. The instrument's bridges are made of deer horn, ebony, or very occasionally from camel bone. Synthetic material is now common as well. 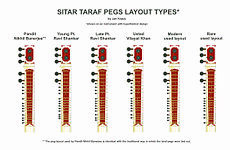 There are two popular modern styles of sitar offered in a variety of sub-styles and decorative patterns. The two popular styles are the "gayaki style" sitars (sometimes called "Vilayat Khan style sitars") and the full decorated "instrumental style" sitars (sometimes called "Ravi Shankar style sitars"). The gayaki style sitar is mostly of seasoned toon wood, with very few or no carved decorations. It often has a dark polish. The inlay decorations are mostly of mother of pearl (imitation). The number of sympathetic strings is often limited to eleven but may extend to thirteen. Jawari (bridge) grinding styles are also different, as is the thickness of the "tabli" (soundboard). The other type of sitar, the instrumental style, is most often made of seasoned toon wood, but sometimes made of (Burma) teak. It is often fitted with a second resonator, a small tumba (pumpkin or pumpkin-like wood replica) on the neck. This style is usually fully decorated, with floral or grape carvings and celluloid inlays with colored (often brown or red) and black floral or arabesque patterns. It typically has thirteen sympathetic strings. It is said that the best Burma teak sitars are made from teak that has been seasoned for generations. Therefore, instrument builders look for old Burma teak that was used in old colonial-style villas as whole trunk columns for their special sitar constructions. The sources of very old seasoned wood are a highly guarded trade secret and sometimes a mystery. There are various additional sub styles and cross mixes of styles in sitars, according to customer preferences. Most importantly, there are some differences in preferences for the positioning of sympathetic (taraf) string pegs (see photo). Amongst all sitar styles there are student styles, beginner models, semi-pro styles, pro-models, master models, and so on. Prices are often determined by the manufacturer's name and not by looks alone or materials used. Some sitars by certain manufacturers fetch very high collectible prices. Most notable are older Rikhi Ram (Delhi) and older Hiren Roy (Kolkata) sitars depending upon which master built the instrument. Though not technically a sitar, the electric sitar is a guitar with a special bridge, known as the "buzz bridge", and sympathetic strings, to mimic the sitar. It has 6 strings, and lacks movable frets. Tuning depends on the sitarist's school or style, tradition and each artist's personal preference. The main playing string is almost invariably tuned a perfect fourth above the tonic, the second string being tuned to the tonic. The tonic in the Indian solfège system is referred to as ṣaḍja, ṣaḍaj, or the shortened form sa, or khaṛaj, a dialectal variant of ṣaḍaj, not as vād, and the perfect fifth to which one or more of the drones strings are tuned is referred to as pañcam, not samvād. (the last three in the upper octave). The player should re-tune for each raga. Strings are tuned by tuning pegs, and the main playing strings can be fine-tuned by sliding a bead threaded on each string just below the bridge. Chikari strings: Sa (high), Sa (middle), and Pa.
Kharaj (bass) strings: Sa (low) and Pa (low). Jod and baaj strings, Sa and Ma. In a "Gandhar Pancham" (Imdadkhani, school of Vilayat Khan) sitar, the bass or kharaj strings are removed and are replaced by a fourth chikari which is tuned to Ga. By playing the chikari strings with this tuning, one produces a chord (Sa, Sa, Pa, Ga or Sa Sa Ma Ga or Sa, Sa, Dha, Gha depending on the raga). To tune the sympathetic strings to raga Kafi for example: I Sa, vii ni (lower case denotes flat (komal) I Sa, II Re, iii ga, III Ga (Shuddh or natural, in Kafi the third is different ascending and descending), iv ma, V Pa, VI Dha, vii ni, I Sa, II Re, iii ga. There is a lot of stylistic variance within these tunings and like most Indian stringed instruments, there is no default tuning. Mostly, tunings vary by schools of teaching (gharana) and the piece that is meant to be played. Vilayat Khan had been touring outside India off and on for more than 50 years, and was the first Indian musician to play in England after India's independence (1951) and to introduce the sitar to world audiences. In the late 1950s and early 1960s Ravi Shankar, along with his tabla player, Alla Rakha, began a further introduction of Indian classical music to Western culture. The sitar saw use in Western popular music when, guided by David Crosby's championing of Shankar, George Harrison played it on the Beatles' songs "Norwegian Wood (This Bird Has Flown)", "Love You To" and "Within You Without You", recorded between 1965 and 1967. The Beatles' association with the instrument helped popularise Indian classical music among Western youth, particularly once Harrison began receiving tutelage from Shankar and the latter's protégé Shambhu Das in 1966. That same year, Brian Jones of the Rolling Stones used a sitar on "Paint It Black", while another English guitarist, Dave Mason, played it on Traffic's 1967 hits "Paper Sun" and "Hole in My Shoe". These and other examples marked a trend of featuring the instrument in pop songs which Shankar later described as "the great sitar explosion". Speaking to KRLA Beat in July 1967, he said: "Many people, especially young people, have started listening to sitar since George Harrison, one of the Beatles, became my disciple … It is now the 'in' thing." Before any of these examples, however, the Kinks' 1965 single "See My Friends" featured a low-tuned drone guitar that was widely mistaken to be a sitar. Crosby's band, the Byrds, had similarly incorporated elements of Indian music, using only Western instrumentation, on their songs "Eight Miles High" and "Why" in 1965. Led Zeppelin's Jimmy Page talked about his love of Indian music, saying: "I went to India after I came back from a tour with the Yardbirds in the late sixties just so I could hear the music firsthand. Let's put it this way: I had a sitar before George Harrison got his. I wouldn't say I played it as well as he did, though …" The East Indian scales used on the track "Friends" (Led Zep III) "Kashmir" (Physical Graffiti) are considered[by whom?] fine examples of the influence of the sitar in rock music. The Doors extensively used Indian and near eastern scales in their psychedelic soundscapes. Robbie Krieger's guitar part on "The End" was heavily influenced by Indian ragas and features melodic and rhythmic qualities that suggest a sitar or veena. Fleetwood Mac's Gold Dust Woman features the instrument, as well. Many pop performances actually involve the Electric Sitar, a solid body guitar-like instrument quite different from the traditional acoustic Indian instrument. Progressive metal band The HAARP Machine uses sitar in the background of some of their songs. Psychedelic music bands often used new recording techniques and effects and drew on non-Western sources such as the ragas and drones of Indian music. The Electric Prunes appeared in early ads for the Vox Wah wah pedal, which touted the effect's ability to make an electric guitar sound like a sitar. ^ a b Julien Temple (2011-07-18). "BBC Four – Dave Davies: Kinkdom Come". Bbc.co.uk. Retrieved 2012-06-15. ^ Ragini Trivedi, Sitar Compositions in Ome Swarlipi, ISBN 978-0-557-70596-2, 2010. ^ a b Gallo, Phil (12 December 2012). "Ravi Shankar's Impact on Pop Music: An Appreciation". billboard.com. Retrieved 22 August 2015. ^ Lavezzoli, Peter (2006). The Dawn of Indian Music in the West. New York, NY: Continuum. pp. 172–73, 180. ISBN 0-8264-2819-3. ^ World Music: The Rough Guide (Volume 2: Latin and North America, Caribbean, India, Asia and Pacific) (2000). London: Rough Guides/Penguin. p. 109. ISBN 1-85828-636-0. ^ Everett, Walter (1999). The Beatles as Musicians: Revolver Through the Anthology. New York, NY: Oxford University Press. p. 71. ISBN 0-19-512941-5. ^ Lavezzoli, Peter (2006). The Dawn of Indian Music in the West. New York, NY: Continuum. pp. 174–75, 180. ISBN 0-8264-2819-3. ^ Shankar, Ravi (2007). My Music, My Life. San Rafael, CA: Mandala Publishing. p. 100. ISBN 978-1-60109-005-8. ^ Lavezzoli, Peter (2006). The Dawn of Indian Music in the West. New York, NY: Continuum. p. 65. ISBN 0-8264-2819-3. ^ KRLA staff (29 July 1967). "'My Music Not For Addicts' – Shankar" (PDF). KRLA Beat. p. 18. Retrieved 19 August 2015. ^ Lavezzoli, Peter (2006). The Dawn of Indian Music in the West. New York, NY: Continuum. pp. 155–56. ISBN 0-8264-2819-3. ^ Tolinski, Brad (2012). Light and Shade: Conversations with Jimmy Page. New York, NY: Broadway Books. p. 84. ISBN 978-0-307-98575-0. ^ Lavezzoli, Peter (2006). The Dawn of Indian Music in the West. New York, NY: Continuum. p. 158. ISBN 0-8264-2819-3. ^ "The Electric Prunes – Vox Wah Wah Commercial".